Spend unforgettable moments with us, you are cordially invited. The hotel provides good communication with the main attractions of the capital. The hotel can be reached by tram from the central train station, bus from Frederic Chopin Airport and High-speed City railway. The journey takes about 25 minutes. Winestone offers wines from around the world as well as Polish and international dishes. A wide selection of comfortable and spacious rooms to meet the needs of all guests and provide an ideal place for work or relaxation. Start your day with a delicious buffet breakfast in our breakfast restaurant, which offers a wide selection of Polish and international dishes. Our friendly team is devoted to providing you with efficient service. A real culinary revelation, the Winestone restaurant delights with its wide choice of wines from around the world and outstanding dishes served on les planches (stone boards). Take a culinary journey and explore our tasty cuisine at an attractive price. Very nice and friendly personel, big variety at breakfast. I stayed at this hotel for business reasons, but due to the near distance to teh city center as well the parks and the river promenade I was able to combine it with private quality time. The amenities of the hotel and the staff's great job made my stay as comfortable as possible. I can highly recommend it. Excellent reception staff, well customer-oriented. 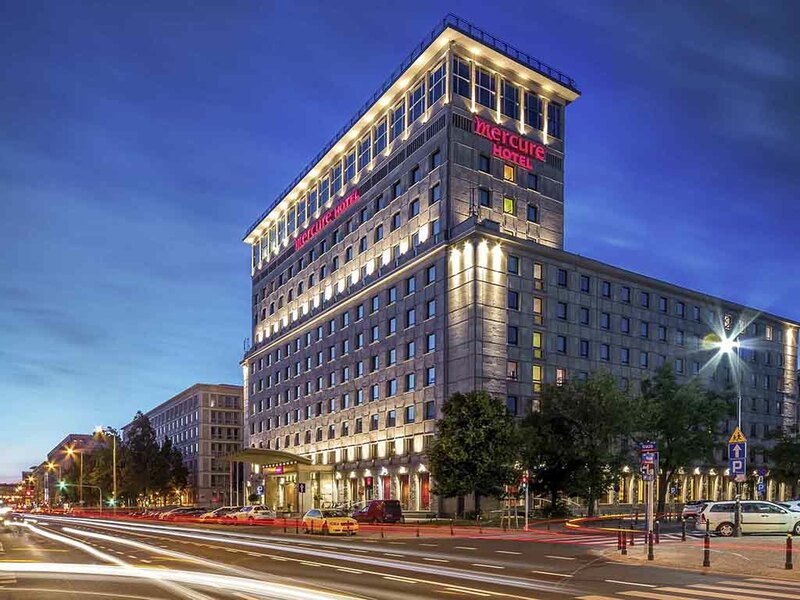 Whenever possible, my priority goes to Accor Hotels, especially Mercure Grand in Warsaw. - Liked: The ladies at the reception were very customer-oriented, and efficient for the checkin and checkout. The room as wished was calm and have a city view, but it was located in front of the lifts while I especially requested it to be far from them. -Disliked: Room in front of the lifts. And the disappointing decrease in the quality of the breakfast : vegetables were not fresh (frozen). The quantity was more than enough. And finally, if the coffee could be better, it would be great. Excellent help from the staff. The lady hotel manager found an IT specialist from another Mercure hotel who came to look at my laptop and solved the problem in 5 minutes. I am very grateful. Mercure Grand is a great hotel in the city centrum. Modern lobby, large rooms and very good service. Large rooms with nice and very clean shower. Bed very comfortable. Quick service in the reception. Many parking places. My third visit to this great hotel. Large and nice rooms. Good winebar. My feedback may not be helpful to improve anything because I have not found anything that needs to be improved. Quick summary: 1. Efficient reception and excellent client help desk ( in particular Mrs. Joanna Piotrowska). 2. Clean room and very good cleaning everyday 3. Superb breakfast with very efficient service (in particular, Panowie Leszek, Michal and Grzegorz). In addition, this time we had some personal issues and received so much warm and greatly appreciated support from a number of people in the hotel! Looking forward to coming back in less than 3 weeks! Stayed for a couple of days. Clean rooms with nice views. Breakfast was excellent with lots of different options. I had a light dinner one day which was very good too. I stayed in the hotel couple of nights. I am a silver member of Accorhotels program but in this hotel I never felt it. Lines for check and check out were long. The floor was divided to two types of rooms: regular and priority, when you enter the floor you can see if you are priority guest or not as they have signs near elevator. The room was clean but very small, It seemed that even in Ibis the rooms are bigger. Breakfasts were good. Lovely hotel. Can't fault it. Great hotel. Very large and nice room. Very clean bathroom. Large nice shower. Very king staff at the reception. Tasty breakfast. Nice central location in Warsaw, really good hotel facilities, clean and nicely decorated. I really liked the breakfast in the mornings, with nice selection of warm food & egg chef. Bed was okay, but could be a little more comfortable. MY EXPERIENCE IN YOUR HOTEL HAS BEEN WONDERFULLY AND SATISFY ALL ΜΥ NEEDS . Clean room, bed was little uncomfortable but good overall. I did have trouble with the wake up call. I put in for it at 3:00am and there was never a call. I really did not like the way the bathroom and tollit was very inconvenient . there seem to Black Mold in the shower and tub & the bed were to hard. The breakfast was very nice and the people were very helpful. Comfortable and clean but mistakes were made during the invoicing.